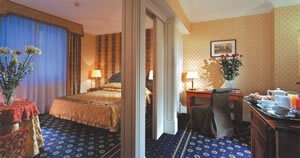 The Best Western Hotel Adriatico is an efficient and well-run business and conference hotel in the centre of Florence. Viewing it from the outside, even its best friends would struggle to call it pretty, for it inhabits a concrete block erected in the 1960s – and we all know what they are like. Nevertheless, there are reasons to consider the Adriatico when you are next heading to the birthplace of the Renaissance. 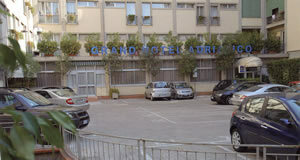 First, it has a car park, and hotel car parks in Florence are as rare as the proverbial hens’ teeth. Second, its staff is composed of persons who are particularly friendly and helpful. 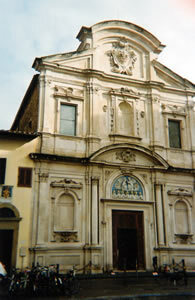 And third, it is only just round the corner from the Church of All Saints (Ognissanti), a place of great beauty at which the traditional Latin Mass is offered every day and in which there is a portrait of Amerigo Vespucci (after whom America is said to have been named). Of course, the rooms at the Adriatico are on the ‘straightforward’ side, so readers of Bown’s Best will want to confine their attentions to the suites. 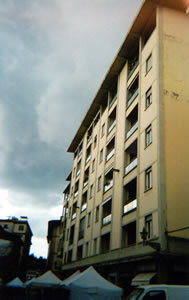 I stayed in one on the first floor, number 122. Its colour scheme was of dark blue (for the patterned carpet), red and light gold (for the drapes, the curtains and the upholstery) and its lighting was from table lamps and wall lights. The passage hall led into a sitting room with a sofa and a writing desk, and beyond that was the bedroom with two armchairs. The two rooms could be separated by sliding screens. The view was only onto the side of the next building, so the windows were of opaque glass. The bathroom was decked out with much black and grey marble and contained two wash basins, a loo and a bidet. The bath tub had a built-in shower compartment and a jaccuzzi facility. I found this a comfortable billet – not least because the staff went to great pains to make my bed properly soft, provided me with a soft pillow from the ‘pillow menu’, sorted out the failing light in the bathroom and responded positively to my request for an iron and an ironing board. 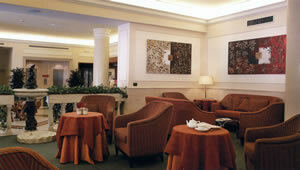 Breakfast can be busy at the Adriatico, for the hotel has over 120 rooms. But, again, I must salute those members of staff I encountered. They really did work very hard to make sure all went smoothly. In summer an outside courtyard is available for the morning meal. But my visit was in winter, so I inhabited one of the brightly-lit breakfast rooms. From the buffet each morning I secured croissants, poached pears, slices of crusty brown bread and good bacon. I was particularly taken with the apple turnovers, which I found – when eaten with a fresh apple – tasted just like the toffee apples of my youth. Delicious. To my table were brought pots of coffee, dishes of ice cubes and, of course, my concluding cappuccini. 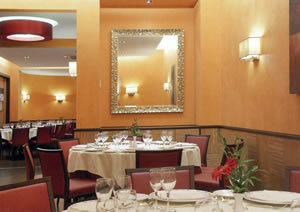 At the front of the hotel is the Ristorante Opera. 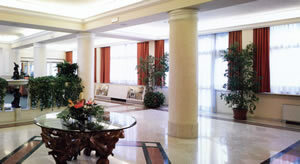 It feels very much part of the hotel, but it is really a separate establishment, run by the jovial Mr Dario Rossi. Here I sat on a red leather seat and – for once – did not object to the canned music. For it was, appropriately, of grand opera. Mr Rossi and his team looked after me well and I enjoyed my dinner here. A three-course set meal with a glass of wine is offered for 28€, and even my four courses from the carte were only 42€, so the Ristorante Opera offers keen value. I began with prosciutto and melon, and was impressed by the very high quality of the ham. Then came ravioli with meat sauce and chestnuts – a robust and pleasing dish. Beef tenderloin steak, with roasted potatoes, sautéed onions and green beans, was carefully done, and my concluding crunchy hazelnut mousse was absolutely splendid. The wine list has just 29 bottles, all Italian, and vintages and producers are not given. My chardonnay from the Alto Adige region, with its suggestions of melon and white peach, was smooth and elegant (Lis Neris, 2012 – 12€, half), and my 2008 Chianti Classico Riserva was typically fruity and full-bodied (28€). My meal, then, was like the Hotel Adriatico itself: straightforward, modestly priced and served by those who combine friendliness with pride in their work. Via Maso Finiguerra 9, 50123 Florence, Italy.